I met Carlos Perez in Cuenca, South of Ecuador. He is a dirigente of the Junta de Agua of the area, the organisation for the community administration of Water. Carlos is a lawyer, and I meet him in his small office on the first floor in a central road. On the walls, there are a couple small posters with an eclectic collection of maxims: one concerning the profession of the solicitor (the one that stroke me said: as a solicitor you have to defend rights, but if you see that rights conflict with justice, then fight for justice), and one listing some Buddhist maxims of good living (the one that hit me was: every year visit a place you have not seen before). The Junta de Agua was involved in a long struggle to defend community water rights. In 1996, a municipal law threatened traditional communal rights on water. The municipio of Cuenca prentended to usurps the right of communities greater than 150 families to self-manage water provisions. The argument was based on rationales such as these: people are incapable to administer water provisions, they cannot make the sufficient investment, they are ignorant, they are inefficient. In 2003 a national law is discussed that attempts to nationalise community water as a first step towards privatisation. The bills spark a long season of struggles, large mobilisations and of civil disobedience that in the end succeed in winning a U turn from the government. Instead of the law expropriating communities of their water commons (and water commoning), the Junta de Agua manages to draft and push a law in which community autonomy is fully recognised. As Carlos proudly show me, article 2 of the 2003 ordinance of the canton of Cuenca aknwoledges the right of community systems to participate to the planning, construction and administration of water systems, while article 3 states that by community systems it is meant self-managed community systems as well as those in which the community co-participate with other institutions. But the troubles are not finished. 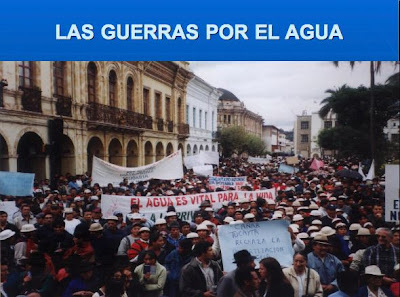 Today the struggles are not only for the defense of water and water self-management, but also against mines, as the two issues are increasingly going together. Carlos shows me a coloured map around the area of Cuenca, where large areas of mine concessions signed in by the government are clearly indicated. The question of the threat posed by mining to water commons and water commoning is increasingly urgent and controversional. Not only because mines need a lot of water for their operation and, also, pollute water sources, but also because they are responsible for the 20% of climate change. The struggle against new mining therefore is not just a struggle to defend local commons, but also global commons. Struggle against mining are quite on the rise in the region. 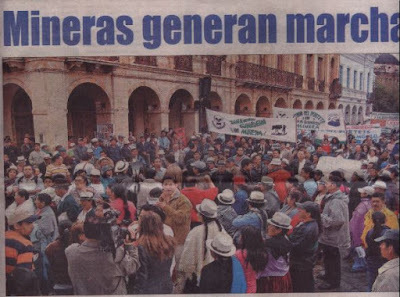 In North Ecuador, there has been a series of successful struggles against mining and in the defense of community forests among other commons in the region of Intag. In North Peru, in the region of Ayabaca and Huancabamba, there are strong conflicts against mines and in defense of water commons. Returning to water, Carlos insists that what people want is administration autonomy with no external interference, where it is community assemblies and not some manager or bureaucrat who decides what to do with the water and how to do it. He also makes an economic case: “In community management”, he says, “each family pays $2 a month for water in order to collect the fund necessary for the maintenance of the supply. In cities like Cuenca one pays $10 a month. Why? Because of the highly paid bureaucracy. In the community instead, the president of the water committee does not earn anything. In Cuenca the managers get $3000 a month”. However the payoffs for the communities in keeping control power over their water commons, is not simply monetary. Water here is a commons not just in an ideal sense, a principled sense. The water-commons Carlos is talking about is a commons because it is resource truly pooled by a community who must engage in commoning for its administration and utilisation. Hence saying here that water is a common, it is saying that it is an organic expression of the life of the community. If you have taken away their right to administrate water, you have taken away some important aspect of the life of the community. To better understand this, I could mention the fact that as I am writing, there is a struggle in Italy against water privatisation promoted by the Berlusconi’s government. Also here the movement argues that water must remains a commons. But in this case, water commons is identified with the “public”, i.e. with the right of the local councils — not directly of the communities — to administrate it. The difference is essential and resides in water commoning. When I naively ask Carlos to help me to understand what in involved “administering water” he explains to me that water management does not only serve the functional objective of administrating water, but it is a crucial moment of commoning within the community. In administrating water, the individuals may well get a monetary pay off (say, the $2 paid instead of $10), but the community also exercise power and autonomy, and this is a value on its own terms with its consequent benefits. This is a value that no rational choice theory is able to capture with its models. For some of these theories, especially those influenced by the Nobel Laureat Elinor Ostrom, commons are justified uniquely in terms of their greater efficiency and payoffs, but little or no study of the value created by commoning is studied. For example, Mingas are traditionally used to take care of maintenance of infrastructure. Minga is a quechua word used by various ethnical groups throughout the Andes and refer to unwaged community work, in which men, women and children all participate in pretty much convivial ways and generally ends up in big banquets. Children, women and man, young and old, all participate in the water Mingas which, as Carlos reminds me, “are also Mingas of ideas, of desires and imagination.” Hence, not only pipes are laid, stones are moved, metal is bent, food is shared by the entire community, but also through the administration of water people meet and discuss other important things besides water, other things of relevance to the community. “There is no hierarchy in Mingas” says Carlos, “children, women and man all participate in Mingas”. And the things that the managers of capitalist companies will not get, is that there is an other sense of measure going on in Mingas. The search for efficiency is not the absolute value. To dig a hole and put up a pole could be a heavy work if only few people have to do it so as to minimise cost and maximise productivity. But if the entire community is involved, you do not feel it (although the “efficiency” obtained in this case is quite low): “in the Minga you do not feel the work because everything is cheerfulness (alegria) and distraction and in the end it is participation.” In the Minga, as you are sharing (compartir), you are also living together (convivir).” The “law of Ayni” — another word for Minga, referring to a system of work and family reciprocity within the member of the ayllu — “is reciprocity”. And while he is saying this, he crosses his arms and shows me the Ande’s cross, one in which one hand gives and the other receives. Ayni consists in labour help in agriculture or construction that will be reciprocated in equal form by the family helped today. As a say puts it: “hoy por ti, mañana por mi”, “today for you, tomorrow for me”. The “retribution” is generally food and drink for all. There is a connection between the laws of reciprocity within communites upon which the patterns of sharing and commoning are constituted, and the community’s government of power. This in two senses. First, the government of power in the Weberian sense of distributive power, relational power. The “convocatoria”, the “Minga” — what we understand as community sharing – is grounded on reciprocity. Reciprocity seems to be a measure for its re-occurrence in time. Which implies that the principle of community sharing depends in turn on some principle of equity, hence of obligations, hence (taking equity and obligation together) of justice. The measure of things is justice, and ideas of justice can only be culturally defined (or culturally challenged). Thus, sharing and justice are intertwined. Second, the government of power understood as collective power to do. “Reciprocity is power” says Carlos, in the sense that it is this dance of life at the rythms of reciprocity cycles and Mingas that involves that generation of obras, of works, but also that generates cheerfulness, and give rise to unity among the community. Minga is also the context for the nurturing of the powers of the new generation, as in the atmosphere of conviviality and cheerful practical jokes (like when Carlos’ mother put a frog behind his back, as he remembers with a smile), as when the youth begins to learn new experiences, explore sexuality, recognise the cultural limitations or begin to challenge them. This entry was posted on Saturday, April 3rd, 2010 at 3:28 am	and is filed under commons. You can follow any responses to this entry through the RSS 2.0 feed. You can leave a response, or trackback from your own site.